It was a relatively flat race course that was a joy to run. However not all the race-organizing stars aligned. 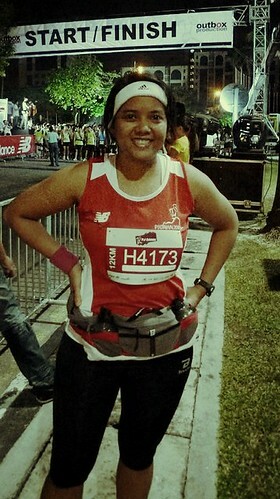 I initially didn’t want to race PJ Dawn because the flag-off time was so unGodly early: 3am for 21km and 4am for 12km. But then I remembered how awesomely cool (literally) it is to run before the sun rose, so I signed up for the dozen km category during its peak price period (RM60). Furthermore, the venue was near to where I lived – so near I could possibly jog a warmup 5k to get there. But of course I didn’t – so we drove from home at around 2-ish in the morning to get to the venue before the half-marathoners started. I always liked watching the further distance runners go off first because it’s a preview of what I’ll be going through. In short, it’s just so darn fun. After arriving and negotiating an unofficial sidewalk parking at Kelana Jaya Stadium, I noticed the huge amount of trash strewn around its back perimeter. The municipal obviously didn’t have time to clean up the last event that took place there (or some Malaysians are just the worst litter bugs), which is rather embarrassing, especially if out-of-towners were present. Heck, I am local and I was disgusted. I finally reached the start line and I could see thousands of half-marathoners donning lime green vests already poised in position, waiting for the blare of the flag-off. Moving show lights bearing the organizer’s company name beamed and bounced off buildings while loud upbeat music permeated the silence of the predawn, revving up the feeling of excitement. For a moment I wondered if the sleeping tenants of the nearby condominiums were cursing at the eccentricity of us crazy runners who chose to toe the line so early in the day. After parking myself on the side behind a temporary metal railing barricade, I noted a video cameraman opposite me, perched backwards as a pillion rider on the back of a huge motorbike. He was being gingerly held steady by its driver whose toes could barely reach the ground. The dynamic duo was ready to burn rubber once the 21km runners started to dash. And soon enough they did – I estimated around 3,000 runners flowed underneath the start line banner, all trying to dodge a photographer who planted himself in the middle of the crowd and then moving to the side, nonchalantly as though he was strolling through a park. About 5-10 minutes later, the half-marathoners trickled to the last few people who came late. “Last call for half marathon!” cried the emcee through a portable loudspeaker. Sure enough there were still a few runners waddling through, confident and undeterred to be at the back of the pack. I still had an hour to kill before my time to run, so I scouted the area, did some warm-ups and stretches, and checked out the New Balance Nimbus minimalist running shoes that were being displayed for sale. Before I knew it the 12k runners, who wore red vests, were called to the starting line, and for the first time I was quite near to the front, about 7-8 layers of people away (the boon of entering a moderately-sized local race). We also happened to be near a boom truck that was lifting its crane up with two photographers in its bucket to allow them to get a bird’s eye shot of the runners. But because the truck was spewing out so much foul and toxic exhaust smoke and nearly choking us all, we booed at the driver, yelling at him to stop cranking it up. Someone in the crowd remarked sarcastically, “We’re out of breath before even running!” The rest of us clicked our tongues in agreement, coughing and fanning away with our hands the fading but unmistakable traces of carbon monoxide. The boom truck finally quieted down – and soon with some clapping and hooting, we rushed through the start line: the 12km race was finally on! I decided to start moderately slow in this race and build my way up, instead of giving all out in the initial stage as I often do. In that process I lost my running buddy who had adhered to my outdated modus operandi to start out fast. At any rate, everyone’s racing their own time, so it didn’t bother me that she left me inhaling kicked-up asphalt dust. The first kilometer saw us running onto the highway that eventually U-turned into the direction of the old Subang Airport, and as we ran under the underpass of that U-turn to enter km2 we faced the first and only elevation in the course that slowed some runners to a walk. The uphill was extremely mild compared to the hilly routes I normally practice on, so I moved on quite steadily. Shortly on my left I saw a man exchanging angry words with a policeman who was holding up traffic for our safety – I think he was peeved that he couldn’t budge his car forward because of us. The first water station came at km3, and from there onwards it was stationed every 3 kilometers. The route was pretty much straight and flat so for some runners going through it was simply a breeze and they quite possibly achieved some personal bests. Speaking of breeze, it got a bit windy at some points so it made for a cooling experience. However with wind there is also some resistance in moving your body forward. When I reached the 2nd water station at km6 I was already 43 minutes into the race. I had expected some isotonic drinks to be present but there was still only water. Needing to refuel slightly, I brought out a small packet of jelly beans which I had packed inside my fuel belt (I’m not big on energy gels). I chewed on about 50 calories worth of candy, just to bring back a little bit of sugar into my bloodstream. I still had about half a bag left so I saved it for the next 20 minutes. As I left the km6 water station, we turned right into the Ara Damansara residential area and throughout the next 2km the area was semi-dark. During this time I witnessed some lightning flashes which made for a beautiful show that lit up the clouds in the dark sky. Simply a breathtaking experience. Of course at the same time I prayed that the weather would hold and the rain wouldn’t come. I’ve noticed a particular scenario more times throughout this race than in others that I’ve joined: the girls in PJ Dawn are more damn competitive. I must have passed half a dozen girls, only to find out a few paces later that they decided to shift their gear downward to overtake me. I, having refueled on mere jelly beans, couldn’t stand to be bypassed by these other female runners who shared my pace so I played a little game with them too, by overtaking them again. It is hilarious when I come to recall those juvenile moments of who was faster than who. Some of the time I could overcome a few familiar girls, but of course the ones I couldn’t outpace I gracefully accepted their tenacity and better stamina, and minded my own pace. Km9 was the last water station, and again we were “only” served mineral water. Holy smokes, what is wrong with this race – would it have killed them to provide us sugar-depleted people some much needed 100Plus or Gatorade? I didn’t see the point in stopping at the last water pit so I ran through it and chewed on the remaining bits of my jelly bean stash and washed it down with water left in one bottle on my fuel belt. I maintained my pace in the last 3km of the race, hardheaded to finish strong, as always. On the way a bald fellow runner who had finished the half marathon much earlier decided to be an active spectator on the side and generously gave out high-5’s and encouraging rah-rah’s as some of us passed him. What a nice gesture that was. As I approached the finish line there were a few more of these wonderful like-minded folks giving selfless support in the form of claps and cheers, which is always great. Up ahead I see M on the side with the camera on video mode, and with a large intake of fresh air, I sprinted to the finish line and presto! I finished 12km in 95 minutes, 5 minutes off my original target of 90 but hey, I was happy and proud of what I had achieved. Best of all, I ran (or rather, my version of what running is) the entire way with no walking breaks (except for the water station stops) and my lactate threshold has improved in leaps and bounds, compared to when I started joining races a year ago. Video: Won’t you run a mile in my shoes? Watch my 12km flag-off, a little bit of during & finishing. After finishing, I followed the crowd to pick up my goody bag, which contained the finisher’s medal, some muscle-cooling medicated strips and body wash samples plus discount vouchers off new shoes. I met up with Ev who managed to finish #84 in the women’s category, of which I am immensely proud and envious at the same time (she finished “only” 5 minutes before me – apparently she qualified for a finisher’s t-shirt but since no one informed her, we left for home without it). As I queued up for food I was shocked to arrive at the table, only to find empty boxes awaiting us. What, no food? How horrible! Worse still, no Milo trucks or 100Plus drinks were seen. This is the first time I’ve ever gone to a race where there was no food left. What gives? After taking some photos with a colleague whom I had bumped into, we decided to head out to a McDonald’s to grab breakfast since I was so hungry (I always am after a race). After a carbo-reloading session that would make even the most obese comfort eaters blush, we went home at around 7am, contented with our running performance. In true Sunday fashion, I slept till noon, only to wake up again to enjoy the day and anticipate the oncoming of delayed onset muscle soreness. The race course was mostly flat, easy for seasoned runners and friendly to budding ones. 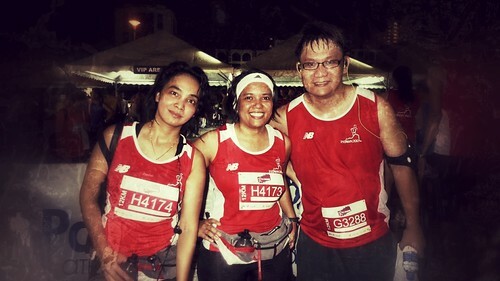 The race time was pre-dawn, meaning we could avoid the sun and the unforgiving humidity that comes with it. Many policemen and race marshals oversaw the entire course, giving us all some feeling of security. There was plenty of water for everyone at the water stations, with volunteers refilling them up fast. No isotonic drinks for runners at water stations – which is horrid especially if you didn’t carry your own sugar supply. Some parts of the course were riddled with pebbles and stones, and at some points, gaping potholes. One needed be mindful of them, especially barefoot runners (I saw one such runner at km10, my – how brave of him, although I am of the persuasion that people aren’t meant to run barefoot on tarmac – but that’s just my personal take). Despite having a lot of ‘boys in blue’ and marshals along the way, some vehicles continued to speed – I saw a liner bus just bulldozing down the highway as I was finishing up km 10. Frankly I was a little bit scared for my life. But such is the bane of running on semi-closed big roads, there still is some risk to your safety. How I deal with it is to not put my music up so loud so that I can still reasonably hear my surroundings. Screeching tires? Move! My running buddy, despite finishing in top 100, did not know she was qualified for a finisher’s t-shirt, making me think that the race marshal at the finish line who handed out her paper stub with the number didn’t even bother to inform her. Not that she was hard up about the t-shirt, it’s the courtesy of recognition for the runner who rightfully earned her top ranking that is important. Food ran out before the late finishers could even get some. Later I found out what had happened when I called up Eugene (the person responsible to setup the registration process of PJ Dawn): Apparently the half-marathoners who had finished early grabbed food for more than one person, presumably for their other friends. However because of this inconsiderate act of hoarding, other people lost out. The race organizers should have instilled order by putting, e.g., a banana inside every goody bag like how it was done during SC KL Marathon or Nike’s We Run KL. Very disappointing. No Milo trucks or isotonic drinks for the runners. Seriously? Are they that cruel? Or were the drinks so carefully hidden that even I could not find them? When I pay money for a race, I don’t just expect to run a decent course, I also expect some reasonable treatment that shows me the organizers are serious about my well-being as a runner. I personally don’t think it’s a tall order to be expecting some buns or isotonic drinks at a race. These simple carbs are necessary to replenish us after an exhausting ordeal. Despite having a Twitter account the organizer never bothered to update it from December when they officially revealed the event. They instead channeled updates only on Facebook, forgetting not everyone in the world is a user (or fan) of that particular social media network. They should’ve taken a page out of other race organizers like SCKLM or Adidas KOTR where updates are regularly given via Twitter too. Linking FB posts to Twitter is totally possible! Because there were more bad points in my book than good, I am skeptical to run any more races organized by Outbox Production (unless they can assure me and other runners that next year will be better). With 2013 seeing them take the race course out to Putrajaya (presumably because they want to maintain the initials of “PJ” in the race brand name, even though technically there is only one and original PJ – Petaling Jaya! ), I would not be in a hurry to register for that upcoming event. Sorry, PJ Dawn. You were great but at the same time, glycemically off-balance and disheartening. @istribawel lari trus! Going for sunday AM run trow? @myindodotcom yes 🙂 how abt you? Yey finished #PJDawn! 12k in 95mins. But boo they ran out of food! @lotfiismail tau takpe. Pecah rekod tak? Having McD’s breakfast set after #PJDawn. The only thing I can get at this hour. So hungry! @myindodotcom #ehsamalah breakfast for chempiang!! @nannoor Congrats! Tanya sket – when u were given the paper stub w ur finishing number, diorang habaq tak kena kutip t-shirt? @runfairyrun so i didnt bother to ask where was the booth. I follow je the people infront of me and tetiba i q for water. Hahaha. @runfairyrun tq tq. smlm aku try login via twitter. btw, very detail explaination. good job! @nannoor #PJDawn aku tahun depan = #PJDowan haha. @nannoor thank you. kalau kau rajin boleh tak kau sharekan link tu kat FB PJDawn? Bagi depa baca sket. Aku takde FB, malas. @nannoor oh you are so lovely. thank you darling. very nicely written on reviewing the entire running event. really did enjoy reading it! Thanks TehTarikDrinker, saw your post on your PJ Dawn experience too. Keep on running!